Former US Secretary of Defence Donald Rumsfeld made the following observation: "because as we know, there are known knowns; there are things that we know that we know. We also know there are known unknowns; that is to say we know there are some things we do not know. But there are also unknown unknowns, the ones we don't know we don't know". Although this sounds a little torturous (and not in the washboarding sense!) it conveys a useful view of the world which is particularly relevant to ecology and evolution. When we do research we are usually in the business of moving 'unknown knowns' to 'known knowns'. In the process we sometimes discover some 'unknown unknowns' which then become 'known unknowns'. Obviously, the big issues for science are the 'unknown unknowns', things that may impact on how we model the world which we currently do not take into account. In short, we can't fully explain a system if part of the explanation contains 'unknown unknowns'. Not torturous at all! Kaitorete Spit looking north to Banks Peninsula - Katipo country! As an example, the history of the New Zealand biota was thought to be well known, that is there are 'known knowns'. A fragment of the supercontinent Gondwanaland broke away around 80 million years ago, gradually subsided until it was left with New Zealand and other islands. The present day biota was derived from this long isolation, one feature of which was the absence of terrestrial mammals (other than a handful of bat species). Some of the 'unknown knowns' were just how much land area remained above sea level by the period of maximum submergence around 23 million years ago, which lineages had survived in the New Zealand region versus those that had successfully colonised these islands and when these events had happened. A few years ago an 'unknown unknown' surfaced in the form of a mammal fossil from 16-20 million years ago. Fossils make for great 'unknown unknowns'. They are hard facts that are sitting out there in the crust waiting to be found. In this case the fossil became a new known and generated a bunch of known unknowns', such as how many other mammal lineages might have been around at that time, what happened to these mammal lineages as they were extinct when humans arrived in these shaky isles and how did they come to be in New Zealand? Another area of ecology and evolution where we spend a lot of time thinking about unknowns both known and unknown is in population estimation and monitoring. For most species it is difficult or impossible to locate and count all members of a population. We are left with trying to estimate how many individuals are out there. This could be a 'known unknown' if a species has been found to be present or an 'unknown unknown' if we are just surveying an area to see what is there (like in a biodiversity assessment). Having an accurate estimate of populations allows us to manage and conserve populations. Katipo (Latrodectus katipo) is New Zealand's representative of the widow family, a close relative of the the Australian red back. Katipo live in a fairly restricted and threatened habitat - the dunes of sandy beaches. Katipo are under multiple threats from land fragmentation from seashore developments, competition from an introduced spider species, and the introduction of exotic plants into dune areas. Counting katipo is a difficult enterprise. They are small and relatively cryptic. Although they build nests at the base of dune grasses, these can be obscured by storms. A recent method for counting has been developed using artificial cover objects (ACOs), in this case two small sheets of corrugated roof cladding, with wooden dowels placed between them, are placed in the field. The cladding becomes a warm and dry location that is ideal for katipo to live in. The ACOs can be placed in the dunes for weeks or months and local katipo may eventually move in, providing an estimate for local numbers. Using ACOs can help you to map put areas into dune areas of high and low densities as well as areas with no katipo. 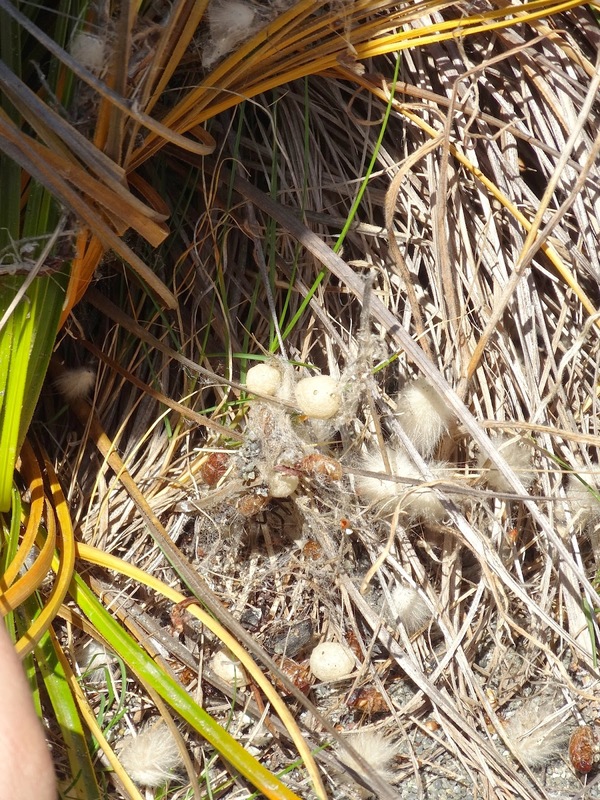 Katipo in pingao nest, note the white egg sacs. Lincoln University student Vikki Smith has used the ACOs to go a step further. Vikki was interested in the effect that the introduced marram grass (Ammophila arenaria) had on katipo populations (a 'known unknown'). Marram has replaced much of the native plant diversity around the dunes of New Zealand. A major casualty has been the pingao (Ficinia spirals) which is generally a smaller plant that forms less dense clumps compared to marram. Pingoa does not bind dunes together as much as marram, meaning that beaches are not as wide with marram in the dunes, as they are more resistant to wind and sea. Vikki wanted to see if katipo had a preference for the native species over the introduced. Vikki took her ACOs out to Kaitorete Spit, a thin strip of land separating Lake Ellesmere from the ocean. The spit has a good population of katipo and is one of the few places in New Zealand where you can find substantial pingao as well as marram. Vikki placed her ACOs in katipo areas with equal numbers beside marram and pingoa clumps. Vikki visited the ACOs over the next year recording katipo that she found there and reporting her findings in the Journal of Insect Conservation. Over the course of the year Vikki was 2-3 times more likely to find katipo under ACOs next to pingao compared to marram. This was most noticeable in summer and autumn. The inference is that katipo numbers are greater in pingoa and the they are more likely to colonise the ACOs through chance. So the preference of katipo for pingoa over marram has become a 'known known'. Although katipo were found in marram, the low density of katipo in this habitat may increase the chances of the local extinction of a population. How marram affects katipo populations is currently a 'known unknown' (long roots drying out the local habitat, reduction of local prey species densities, marram growth structure excluding many sites for nests). These 'known unknowns' provide a useful guide for future research. There may also be an unknown unknowns waiting for us to locate them, invisible for now until further research unearths it. that is the thrill of science! Your home and garden can be a very diverse place. Often when we talk about diversity we think of it as something 'out there' in the wild, away from urban areas. While urban environments might not be as diverse as many locations around New Zealand, they still contain a surprising amount of native and introduced flora and fauna, especially with arthropods. A couple of recent interviews on Radio NZ look at this idea. First, Cor Vink takes us into his home to look at what spiders species he can find. Cor is the inverebrate curator at Canterbury Museum and a former PhD student in the Ecology Department at Lincoln. He is acknowledged as the leading spider expert in New Zealand. Cor talks about the spider species he finds as well as what we know about white-tailed spiders (and their fearsome bite). As well as finding what diversity is present in an urban environment, one can attempt to increase and attract more diversity. 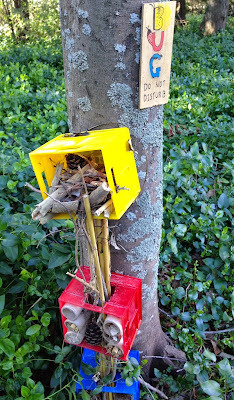 Rob Cruickshank, senior lectured here at Ecology, chats about the profusion of bug hotels that have turned up around Lincoln University campus. These hotels are a result of a collaboration between entomology and landscape architects. The hotels are built with materials that encourage invertebrates to colonise and will help with increasing the local populations. The ento students will monitor the hotels over the next year to see what happens.